Margate was a happy hunting ground for George Irvin’s Family Fair for many years. Up until the 1990s we would visit there every summer, and George is in fact lifetime president of the Twinning Association of the Town! Unfortunately the park on which the fair operated was sold by the local authority and so we could not return, but we do miss it. 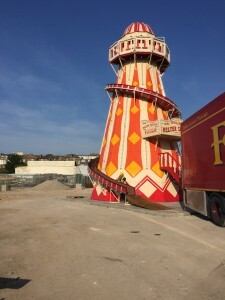 That is why we were thrilled to be invited to support the magnificent Dreamland Project, as Dreamland was our near neighbour in years gone by. We were asked to build our iconic Helter Skelter whilst Dreamland await the arrival of their renovated unit, and were delighted to do this. 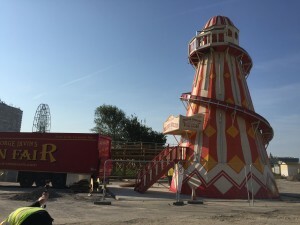 Later on we will be providing a Twister and Swingboats, again pending the arrival of the fully renovated attractions, but Dreamland want their newly arriving guests to have a marvellous time and we are proud to help them. 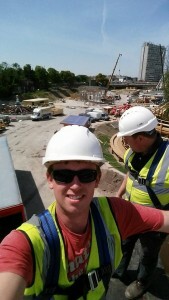 As you can see, we as always follow all strict safety requirements as we work. It might take a little longer but it is certainly safer for everyone!